Getting back on track with foodporning as well. My brother brought me an humongous zucchini instead of flowers. It was huge more than 50cm in length. Basically size of my whole thigh to knee and then some. I didn’t know what else to do than marinate the hell out of the monster. Last year i did the same with a superhuge one and it was a success with my family and friends so I think that was the reasoning behind my bro getting me the enormous zucchini. Lets see how it goes this year. As I didn’t write down last year marinade recipe I did my usual research online and then remember some stuff that friends and family have done and made my own marinade recipe out of that. Taste-wise it resembled last year’s one. So fingers crossed it will work too this year around. Here’s the recipe. Try and let me know how it turns out for you. Oh on a little sidenote this is the same marinade that I use also for cucumbers and wild mushrooms. Latter don’t get the dill and blackcurrant leaves tho, but get carrots and onions and stuff like that. But about that when I get my hands on some. My huge zucchini yielded at 20 jars (450 ml ones). The marinade recipe is for a big pot (5 L) of marinade you can adjust it to you needs easily. Just be careful with the salt, sugar and vinegar. Other ingredients you can play around much more easily. Prep the jars. All places say that you should boil the jars and so on. I can’t handle the fuzz. Just throw the jars and lids to the dishwasher and wash them in one quick cycle with the detergent and then another round without. Don’t open/touch the jars nor the lids before you start filling them. Prep the zucchini to you likings. I cut the zucchini into stalks. NB! if you have a big zucchini take out the seeds and the membrane around it away before pickling. Clean and peel the garlic and chop into thirds or quarters depending on the size. See that you will have at least one or two pieces per jar. I always use some chilli in half of the jars for some extra kick and colour. If you’re gonna use chilies too then chop the chilli with seeds in into around 1 cm wide slices. Break up the dill flower head and stalks so they would fit easily to the jars. Now you’re ready to start on the marinade. Put a big pot on the stove. Add the salt, sugar, bay leaves, tablespoon of mustard seeds, tablespoon of rosé peppercorns, tablespoon of black peppercorns, tablespoon of allspice berries. Leave everything to come to boil. Meanwhile filled the jars. Do following for all of the jars. First put one bigger or two smaller blackcurrant leaves to the bottom. 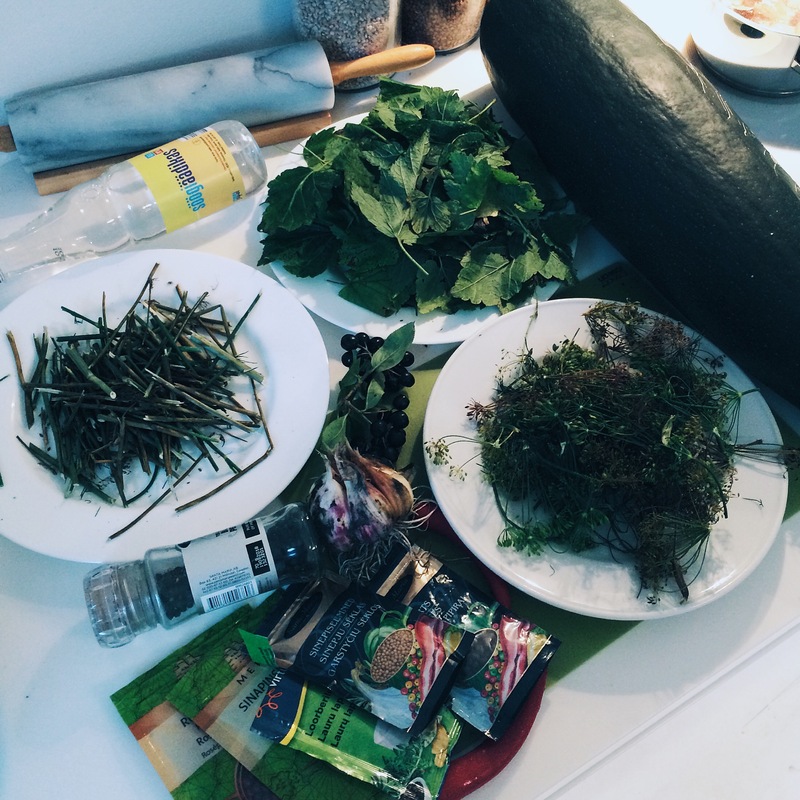 Then add some pieces of dill flowerheads and stalks. Now throw in garlic pieces(s). Drop one rosé and one black peppercorn in every jar. Do the same with allspice berries. If you’re using chilli then drop the piece(s) in. Now fill the jars with zucchini pieces. I like to fill the jars loosely so the serving size wont be too big. 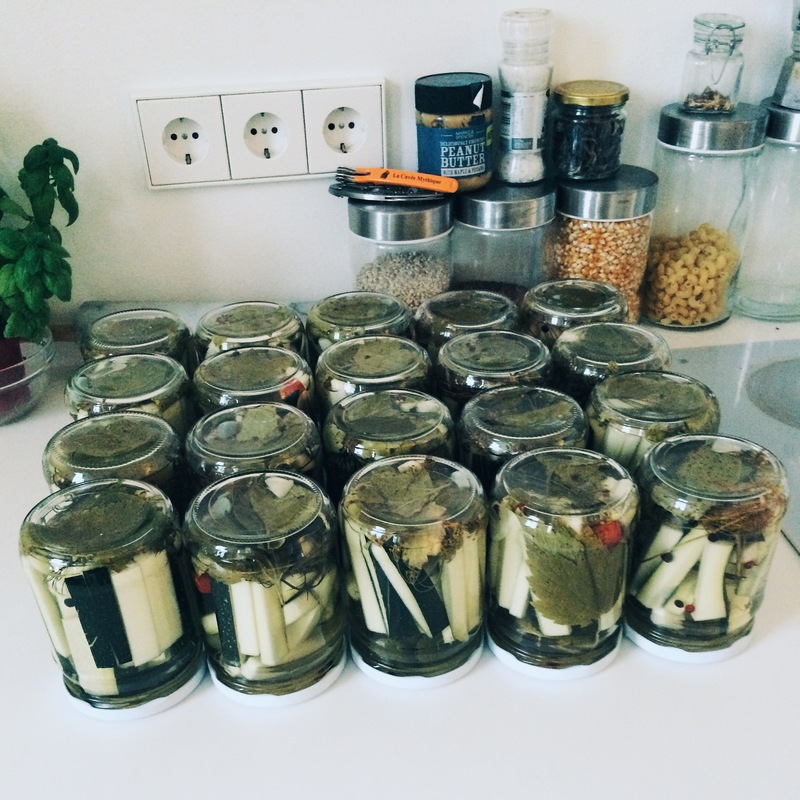 Top the zucchini stalk filled jars with one or two blackcurrant leaves. You’re ready to get the marinade on! When marinade is boiling add the vinegar. I like the taste of vinegar in my marinated stuff so I added the amount quite loosely. But all in all 8 tablespoons is a nice amount for the big pot. Stir everything. Now your marinade is ready. Fill all the jars with the marinade. Fill them to the max! And then lid the jars and lay them upside down on floor or the counter to cool down. You’re done. Now all there is to wait a few weeks at least. Better yet few months and then enjoy the picked deliciousness. When I open the first jar I will update the blog post to let you know how it turned out eventually. P.S. The berries you see on the makings photo are chokeberries that my mom had hidden in the blackcurrant leaves bag. I throw them into two of the jars for experiment. Will keep you posted on how that mix will work out as well. So I managed to get a cold at the same time when summer arrived to Estonia.